EMD 7707, GMD G12 Bo-Bo 1125hp. This is the original export demonstrator. Painted for GMD on one side and EMD on the other. Taken at London Ontario December 1953. This locomotive was sold to Swedish State Railways #105 re# 205 and preserved. I've grown up with that engine in northern Sweden. It ran on the line Boden-Haparanda (on the border to Finland) for about 30 years or so. It was built in 1953 in London, with a 567B engine. Builder's number was A558. 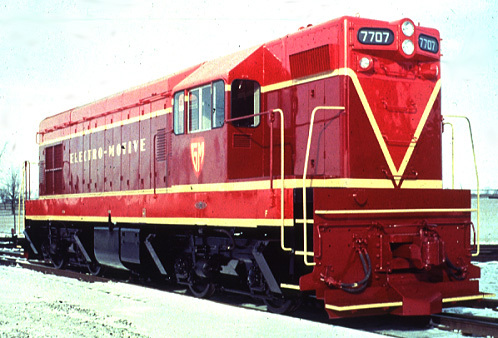 After run-down trials on CN, it was rebuilt with an early 567C engine, repainted "ELECTRO MOTIVE" on both sides, American coupler removed, and sent to Europe. It was handed over to NOHAB, Nydqvist & Holm (Nydqvist Och Holm AB [AB = Aktiebolag = Company)), Trollhattan Sweden, where it was equipped with European side buffers and screw couplings. Incidently, NOHAB went out of the locomotive business in the late 70's or early 80's (don't have exact time at hand..), and was stricken from the merchant register. Nowadays the SAAB museum is situated in the old factory halls (SAAB auto factory is also in Trollhattan). EMD's license was handed over to Kalmar Verkstad, of Kalmar Sweden - which is quite another firm. When Kalmar was bought by the then new ABB firm, which was a competitor to EMD, Kalmar lost the EMD license - as did also Henschel, of Kassel Germany, which was also bought by ABB. There will be no more locomotive building in Sweden; the mechanical parts for the latest AEM7 and ALP44 electrics are built in Finland, and these electrics are only assembled in Sweden. 7707 was sent to northern Sweden, where winter conditions are approximately the same as in Alaska. Heating was soon found to be completely insufficient, and a big heating element was installed at the left front door (considering short hood front). EMD sent an engineer, Mr. John Singelton, with the engine. He was later exchanged for the ex-Dane Mr. Erik Nilsen. For a year or so 7707 run up north. It had a brief demonstration, for just a few days, in Norway - but that was enough for Norwegians to buy the unit after retirement! Then it was sent to continental Europe, andHenschel, for a freshing-up. The heating element was removed, text on hood sides was changed to "HENSCHEL GENERAL MOTORS BAUMUSTER". The unit demonstrated for a year or so in Germany, Austria, Jugoslavia - and, eventually, Turkey. Then it returned to northern Sweden. SJ, Statens Jarnvagar, Swedish State Ry, bought the engine in 1956 and immediately put the dynamic brake out of use - it was of no use; the narrow gauge traction motors were too weak for braking. Otherwise the unit was unchanged for many years. With the purchase came a spare truck, made by Henschel. In 1966 the unit was overhauled. The dynamic brake blister and fan was removed, the unit was repainted in SJ colors, yes - and the worn out Exide batteries were exchanged for Swedish NI-FE, which were not as powerful as the Exides. They became more exhausted after a start-up! The American horn was, and is, uncommon in Sweden. We have whistles. Rumors tell then when the then SJ T5 105, later T42 205, in the early spring of 1958 first came to the northern harbour city of Pitea, the signal showed "stop", the engineer pulled the cord - upon which the folks of Pitea rushed down to the harbour "What, the first ice-breaker NOW?" The cab was later rejected by the crews, and the unit was used as a "B-unit with cab", in M.U. with the SJ NOHAB/EMD-built T44. The independent brake was not M.U.-ed because of the G12¥s Westinghouse 6-SL, and the SJ T44's Knorr. The "forward" and "reverse" electric circuits had to be changed, as the G12 and the T44 at first M.U. test pulled in opposite directions. The G12 had short hood forward, T44 had long hood, eg. "engine", forward. After retirement the unit was in outdoor storage for some years at the backyard "Siberia" of the main workshops of Orebro. Then the Norwegian "GM-group" bought the old 7707, had it restored to operating conditions with the help of NSB, Norwegian State Ry, at their Trondheim shops - yes, and repainted to original demo colors. Only the text "ELECTRO MOTIVE" came too high up, and somewhat too short, on the hoods. The plan in Kalmbach's "Diesel Cyclopedia" is in error! The plan shows a G12 as built in series. The 7707 was the prototype; when built in series the cab was moved towards the short hood 8 inches or so, and then came straight above the truck. On the 7707, the cab is somewhat toward the long hood! Compare photos! I don't know, but I can imagine why: the compressor was immediately behind the cab wall, and somewhat more distance between engineer and compressor was probably in favor by engineers! For the G8 there was no need to move the cab - the compressor was already some distance away from the cab! From Korea comes a beautiful brass model of 7707 - made from the wrong plans! Incidently, Israel also has a Swedish-built T44, by Kalmar, much the same as Swedish State, painted in the same colorful scheme as Israeli G12's and G16's. It was built as a test unit, competing with an EMD/GMD-built unit. I believe the idea was to buy more of what came better. The T44 failed, maybe for economical reasons as all equipment is purely American (save brakes), even the compressor is Gardner-Denver watercooled. Amazing that in cool Sweden the T44 has a compressor thought for hot climates!